Ax, activities : information gathering, nudging, decision-making, role model. These can be internal to your organisation or these can be influences onto external organisations. Lx, leverage : a high leverage might be where a large number of people are affected by the action, where peoples actions are effected over a long period of time, providing a unique piece of knowledge or experience. It is important to note that leverage is not always positive, e.g. managerial meddling which can be solved by ensuring people have a sizeable team to manage. It is possible to reduce the organisations output by doing something as well as increasing it. Tx, time : reducing the time it takes to do things will improve output. e.g. context switching is a proven production killer, as such batching of similar tasks together improves efficiency by reducing the time taken to complete the activity. Reports are more a medium for self-discipline than a way of communication. Writing the report is important; reading it often is not. Improving output can be by increasing the rate of work, increasing the leverage associated with an activity or shifting the mix of activities from those with lower leverage to those with higher leverage. The book highly advocated one-to-one meetings and notes – this should be considered the subordinates meeting, they should last an hour, should be near the subordinates location of work, potential problems are key to cover, both participants should take notes – which acts like a commitment from the subordinate that something is going to happen, keep a list of topics to be discussed, personal issues usually get brought up at the end of the meeting (I, not the author, keep the half hour after a one-to-one free just for such occasions). Decisions should be made in a way where there is a free and open discussion about the problem and potential solutions, a clear decision is made which everyone then fully gets behind. There are challenges with the discussion part because of personal emotions such as pride, ambition, fear, embarrassment and insecurity. Having a chairperson in a group can help ensure that the discussions are suitable and pull the group together to make a decision yet it is key to ensure that not too little or too much time has been spent on the free discussion. There is a strong temptation for the leading officers to make decisions themselves, without the sometimes onerous process of discussions, however if this produces the best result it will only be because of a fluke as opposed to a properly considered range of options. Organisational structure – mission verses function. It is likely that there are elements of both in an organisation but also having people people dual report to both a mission and function e.g. the security guard might need to report to both the site manager but also a global head of security. 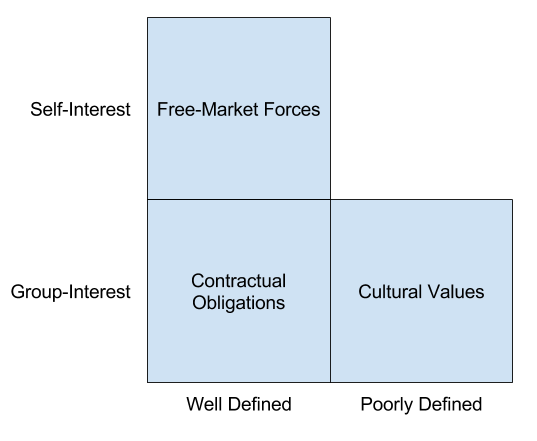 Modes of control – free-market forces, contractual obligations, cultural values. If the problem is well defined (in terms of complexity, uncertainty and ambiguity) and people are only self interested then the free-marked provides a mechanism of you getting what you want (e.g. a toaster). If the problem is well defined but you need to operate as a group then a contract can be formalised (e.g. renting an office). If the problem is not well defined and you have to work as a group then cultural values are key to getting what is required to be produced (e.g. software product development). When issues are identified with subordinated they tend to go through the following stages – ignore the issue, deny the issue, blame others, assume responsibility, find solution. The key transition is to assume responsibility – from the previous stages this is a physiological one, after this the solutions are purely logical. There are two ways that someone can produce more – they either need to be better motivated or they need to receive more training. Both of these are key responsibilities for managers. Separately to general management there are also some specifics for detailing with production management. For manufacturing there is a difference between market demand and production capacity – it is important to forecast the two separately as using production capacity to drive market demand will result in either too much being produced or not enough when you could have sold more. Different sides (marketing and production) can look at how they can meet the others sides numbers which can then be used for bussiness decisions. Metrics provide windows into the black box which is production. The sooner you can identify a problem the better since this will be at the lowest cost.